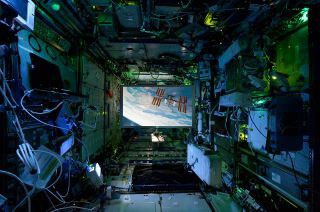 Movie nights on board the International Space Station have just received a major upgrade with the launch of the first-ever projection screen designed for use in microgravity. Previously limited to watching movies on laptop computer screens, or more recently, on iPads, the astronauts and cosmonauts spending six months to a year on the space station can now float back and relax as movies (and other types of media) play on a unique, ambient-light-rejecting, zero-gravity screen. "Movie night in micro #Gravity aboard ISS on our new HD projector, which we use for conferences, tech software, etc.," yearlong space station resident Scott Kelly wrote on Twitter, sharing a photo of the screen as he and his crew mates watched the movie "Gravity" on Saturday (April 25). The new 65-inch (165-cm) ISS Viewscreen was developed by Austin-based Screen Innovations (SI) at the request of NASA. The screen was shipped to the station aboard the SpaceX Dragon cargo freighter that arrived at the orbiting laboratory on April 17. It took eight months for SI to develop the ISS Viewscreen. The company's engineering team had to figure out how to make it extremely portable, quick to deploy and capable of preserving contrast ratios even with the lights on (for most of the time on the space station, the lights remain on). The screen also had to be able to be easily packed away, as a permanently installed screen was not an option. "Fixed [screens are] easy, but a portable setup brings all sorts of challenges to the table," Tom Nugent, technology specialist at SI, said in a statement. The Expedition 43 crew uses the new ISS Viewscreen to watch the movie "Gravity" on Saturday, April 25, 2015. Fortunately, SI had only recently introduced a new screen material, dubbed Slate, that could be rolled up, stretched out and easily cleaned with a microfiber cloth. After seeing a demonstration of Slate in action, NASA representatives agreed that it would be the one to go into space. With the material settled upon, all that was left to figure out was how the screen would be deployed. The idea of using a motorized screen configuration was immediately rejected because, as SI describes it on its website, "well, it's space — there would be no gravity available to pull the weight bar down when the screen was opened." Ultimately, SI devised a bungee cord-based solution that would enable the astronauts to roll out the viewscreen by hand and then mount it nearly anywhere aboard the space station using stainless steel "leashes" at each end of the screen. When not in use, the bungee attach points retract into aluminum tubes, making the screen's storage easier. "It's unlike any screen we have ever manufactured," Robin Kampf, SI's quality control manager said, "and unlike any screen that any company has ever manufactured." NASA paired SI's viewscreen with a commercial HD laser-light projector. The projector is held in place on the space station using Velcro and the same mounts the crew relies on to hold their laptops in place. In addition to serving on movie nights, SI's screen can be used by the astronauts to project their training exercises, as well as the weekly video conferences with their families on Earth. According to SI, the benefits of the much larger screen for these activities are "literally, huge." "Our screen, in life-size, is going to be able to connect [the crewmember] with his family and his children in a way that he would have missed out on," said Tom Cooley, SI's chief operations officer. Click through to collectSPACE to watch a video about Screen Innovations' ISS Viewscreen.